Most parents wish to do anything that helps their children become creative. Your children should have an vent where they can direct their energy while having fun and learning something. They need to unleash their imagination. Parents need to assist them in this development so that they become creative people. There are a few useful tips to help your child become creative. Make sure you follow the instructions below and then you can stop worrying about your kid’s creative side. Reduce television hours. Do not allow your kid to spend all his spare time watching television. When they do watch television, ensure that the programs they watch are educative. You can allow them to play in the backyard in their spare time. Assist them in creative projects like building forts or a tree house. You can also join them in their games and use leaves and twigs for improvised costumes. This is something that will not only hold their interest but also make them creative. Register them for lessons. During vacations, you can register your kids for summer camps or hobby classes. If your kid has an unbounded interest in a musical instrument or is talented at a particular sport, encourage his talent and enroll him in classes to nurture it. This will not only busy your kid with something productive but will also develop his skills and talents. Perform family chores. Nurturing a kid’s creative side is important but equally important is for you to involve the kid in your activities as a family. Make this a weekly routine. You may do this by watching together a movie or by letting your kid help you with paint jobs, etc. These things, simple as they seem, will also help your child to become creative. Provide them a creative environment. 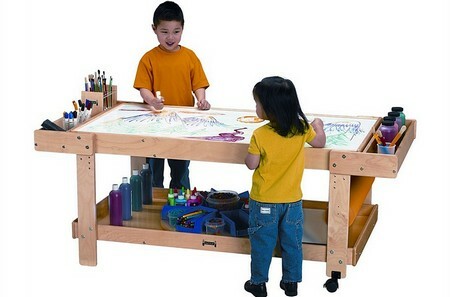 Give your kids such things and such an atmosphere where the kid imbibes creative talents. Make one of the rooms in your house a playroom for the kid. Give them a separate table for all of their work like coloring, etc. Buy them coloring pens, wax crayons, craft materials, clay, and other such things that give them a chance to explore their creative side completely. These are the tips you might find useful enough to raise happy and creative kids. The most important thing is to give them your support for something creative they really want to do. This all will not only turn them into creative minds but will also boost up their self-confidence.